We’d love your help. Let us know what’s wrong with this preview of There Was an Old Dragon Who Swallowed a Knight by Penny Parker Klostermann. We all know that “there was an old lady” who swallowed lots of things. Now meet the old dragon who swallows pretty much an entire kingdom! Will he ever learn a little moderation?! This rollicking rhyme is full to bursting with sight gags, silly characters, and plenty of burps! Parents and kids alike will delight in Ben Mantle’s precisely funny illustrations and in Penny Pa We all know that “there was an old lady” who swallowed lots of things. Now meet the old dragon who swallows pretty much an entire kingdom! Will he ever learn a little moderation?! This rollicking rhyme is full to bursting with sight gags, silly characters, and plenty of burps! Parents and kids alike will delight in Ben Mantle’s precisely funny illustrations and in Penny Parker Klostermann’s wacky rhymes. To ask other readers questions about There Was an Old Dragon Who Swallowed a Knight, please sign up. Penny Klostermann Oh my! I can't spoil the ending! The knight does get eaten but I can't say whether or not he gets out! Synopsis- In a land, far far away, dragons do exist. And one kingdom has a horrible old dragon living in it. A HUNGRY horrible old dragon. And as a knight and his faithful steed go to face the dragon, they find out he’s not so polite either. What I Thought- This is a great parody of the traditional “There Was an Old Lady Who Swallowed a Fly”. Ms. Klostermann has written a funny, well-rhymed story that makes sense. Kids learn a little about medieval life and they will enjoy a good story while lear Synopsis- In a land, far far away, dragons do exist. And one kingdom has a horrible old dragon living in it. A HUNGRY horrible old dragon. And as a knight and his faithful steed go to face the dragon, they find out he’s not so polite either. What I Thought- This is a great parody of the traditional “There Was an Old Lady Who Swallowed a Fly”. Ms. Klostermann has written a funny, well-rhymed story that makes sense. Kids learn a little about medieval life and they will enjoy a good story while learning. I like all of the little details in the illustrations, especially near the dragon’s den (signs: as the dragon is swooping down- “Beware Dragon” and a dragon crossing sign. -> after the knight is swallowed- “Too Late!”). The rhyme in the book is spot on and I found myself singing the “There Was an Old Lady” tune in my head but with the dragon lyrics. :) This is a great debut picture book. It would make an amazing bedtime story for kids! My kids and I love this book! It's far more fun than the original rhyme it's based on, and the verse gallops along in perfect rhythm. The vivid and humorous illustrations are well-matched to the rollicking text and help add to the laughs. It's definitely a book that will keep the whole family amused! Warning: If you read this book be ready to giggle. A LOT! It's a super-fun twist on the tale of the old lady who swallowed the fly that's sure to be a winner with kids and adults. And who doesn't love reading about a super-rude dragon who's lost his manners? Thanks to this book, my kids have added the word 'polite' to their vocabulary and use it constantly. They first thought that word sounded funny. After telling them what it meant, the continue to laugh using the word but they use it correctly in a sentence. They rhymes flowed a little easier for me after the second read through the book. I enjoyed the pictures and thought the outcome was creative. I did not mind reading this book to the kids over ten times in the few weeks we had checked it out fr Thanks to this book, my kids have added the word 'polite' to their vocabulary and use it constantly. They first thought that word sounded funny. After telling them what it meant, the continue to laugh using the word but they use it correctly in a sentence. Hmmmm... plump... googly-eyed... this fellow seems harmless enough. I'm quite fond of the polka-dotted neckerchief he's sporting. Shall we give him a chance? It's not like he can swallow an entire kingdom, right? This gorbellied, hook-nosed scoundrel is NOT to be trusted. Oh, he may look puppy-faced, but just like that old, witless woman who swallowed a fly, this cold-blooded hornbeast hath no clue about good manners. He gorges himself silly – bloatage maximus – until... well... you'l Hmmmm... plump... googly-eyed... this fellow seems harmless enough. I'm quite fond of the polka-dotted neckerchief he's sporting. Shall we give him a chance? It's not like he can swallow an entire kingdom, right? This gorbellied, hook-nosed scoundrel is NOT to be trusted. Oh, he may look puppy-faced, but just like that old, witless woman who swallowed a fly, this cold-blooded hornbeast hath no clue about good manners. He gorges himself silly – bloatage maximus – until... well... you'll have to read the book to find out what happens next. This review has been hidden because it contains spoilers. To view it, click here. Timeless tale of Dragons and Knights… and swallowing things! Following the same pattern as the classic, There Was an Old Lady Who Swallowed a Fly, this dragon swallows one thing after another. As the reader is reminded at the end of each stanza, ‘it’s not polite’. But then the dragon does something even more impolite… he burps! Out comes everything except the knight. Apparently, he’s okay with swallowing a knight! Cumulative rhymes are not my absolute favorite picture-book genre, but I thought this particular book was quite adorable. The bright, colorful illustrations match the cheeky text perfectly, and the rhyme is fractured just the right amount. It's still recognizable as the traditional old-lady-who-swallowed-some-stuff frame, but it's got enough humor to make it seem fresh. This would be a great addition to a fairy tale, dragon, or royal storytime for preschoolers! Klostermann shines in her debut, a brilliant twist on the classic There Was An Old Lady Who Swallowed a Fly - but this time with more Knights! Squires! And Dragons! Kids will gobble up this spunky tale of an impolite dragon who eats and eats. 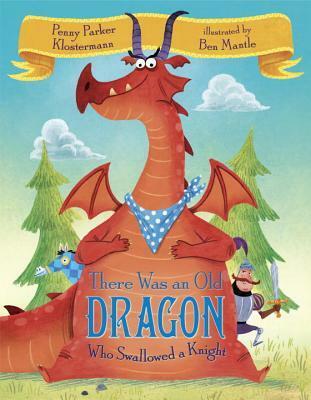 Coupled with Mantle's vibrant illustrations and dashes of humor (the napkin around dragon's neck, his picking his teeth with the knight's sword), this will be a sure-fire hit at story time. And there's nothing shady or impolite about that. I absolutely loathe There Was an Old Lady Who Swallowed a Fly. (Because ew, flies?) To this day, I cannot bear listening to Judy Collins because she conjures up memories of her musical rendition of this oft-hailed childhood classic. That being said, some of the spin-off swallow books are humorous and clever. This dragon/knight one is decent but not a personal favorite. Would make for a good read-aloud and will likely be enjoyed by far less picky children than I. This is a delightful new rendition of THERE WAS AN OLD LADY WHO SWALLOWED A FLY. This new version is adorable as it goes, "There was an old dragon who swallowed the Knight. I don't know why he swallowed the knight. It's not polite!" With great vocabulary such as steed, squire, savory, castle, tassel, and moat, this is the perfect book for those obsessed with all things medieval. Be prepared for a LOT of burping noises after sharing this book as a read-aloud. The format of this book is modeled after There Was An Old Lady Who Swallowed A Fly. Rhythmical and repetitive text with humor as well would make this a great lit lunch read aloud for early to mid elementary-aged students. A fun take on the old "There Was an Old Lady Who Swallowed a Fly" song. This should appeal to those who love all things princessy or all things relating to dragons and knights. I'd better brush up on my singing for storytime! Fun verse with suitably comic illustrations. A lively and distinct twist on the "swallowed the fly" rhyme. Do we really need another version of there was an old lady who swallowed a fly? -yes!!! Rhyme and Rhythm are just right for read aloud and storytime!!!! A fun retelling of the Old Lady tale leading to a nice predictable cumulative tale to add to your read to self and someone collections. this is probably one of my favorite adaptations of the classic picture book. great illustrations. Fun update on the classic song - exceptional fun and colorful illustrations. 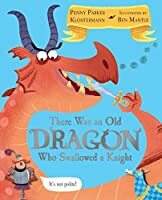 THERE WAS AN OLD DRAGON WHO SWALLOWED A KNIGHT A wonderfully entertaining, circular story that just BEGS to be read aloud! :D Nice going, Penny Parker Klostermann! Loved this rendition! Great vocabulary and illustrations. This would make an excellent read aloud. Would make a great flannel! So. Much. Fun. I'm adding this to my "Old Lady Who Swallowed a..." collection. Can't wait to share with kids! Loved this new spin on a classic. The medieval theme is so much fun. Penny Parker Klostermann writes picture books and poetry for children. Her first book, THERE WAS AN OLD DRAGON WHO SWALLOWED A KNIGHT, was published in 2015. Her next book, A COOKED-UP FAIRY TALE, will be out in 2017. Penny taught school for 26 years before she began writing. She loves all kinds of books, but especially loves very silly picture books that make her laugh. After all, laughter really Penny Parker Klostermann writes picture books and poetry for children. Her first book, THERE WAS AN OLD DRAGON WHO SWALLOWED A KNIGHT, was published in 2015. Her next book, A COOKED-UP FAIRY TALE, will be out in 2017. Penny taught school for 26 years before she began writing. She loves all kinds of books, but especially loves very silly picture books that make her laugh. After all, laughter really is the best medicine :-) Penny has been known to hug her favorite picture books and seriously hopes that someday her books will gain huggable status too. Penny grew up in Colorado and now lives in Texas with her husband.